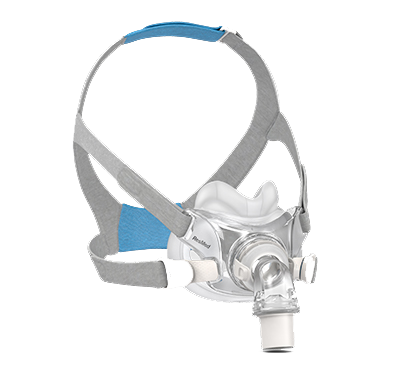 The ultra-compact F30 mask allows you to reach a broader population. The under-the-nose design eliminates issues associated with discomfort and facial marking on the nasal bridge, advisable for patients with claustrophobia or sensitive skin. The F30 is also a solution for patients who want to wear glasses or read during therapy. The AirFit F30 features the same performant QuietAirTM vent as the AirFit F20 high-performance mask, gently diffusing exhaled air to limit noise and create a relaxing environment in the bedroom. You can achieve fast and effective fitting¹ with just one frame, one headgear and two cushion sizes. This streamlined setup simplifies stock management and logistics. Accurate first-time fit helps to reduce callbacks and refits. ResMed external 7 days clinical study of existing 21 ResMed and non-ResMed patients, conducted between 16/04/2018 – 05/05/2018. Data on file; ID A4356449.